Engineering Services & Patent Law Advise - We do not provide either. NOTE: Most of the metal hardware, mesh, vinyl, or fabrics wider than twelve inches that we offer for sale on our website are NOT intended for use in the manufacture of Children's Products & Toys as per: CPSIA 110-314; Aug 14, 2008, unless specifically noted on the product page. We provide certification of CPSIA complaince to customers upon purchase of our CPSIA complaint materials. At additional cost (advance payment required) and with minimum order requirements we can obtain materials similar to most of those sold on our website; that are fully CPSIA certified for use in Children's Products and toys. Please e-mail us your requirements. Next Day Delivery or WE pay the Shipping *See details below Oversize & Overweight packages may incur additional charges. Excess shipping charges may be refunded for smaller, lower weight packages if the actual shipping cost is exceeded by $5.00 or more. To guarantee next business day delivery Place your order by Phone with one of our sales associates, who will confirm that the items you order are in stock for immediate shipment. Orders must be placed on regular business days (not holidays) between 9:30 am and 12:00 noon Central time. Saturday Delivery may incur extra charges and may not be available in all areas. If you are billed for Next Day Air shipping and you do not receive your order the next business day; your shipping fees will be refunded. Refund of original Next Day shipping charges is the total extent of this guarantee, no other warranty is expressed or implied; the extent of our liability for any and all customer damages incurred by late delivery of a customer's order for any reason(s) shall not exceed the monetary value of the original shipping charges. USPS shipping is available. our rates for USPS are based on the total shipping weight of your order. Orders being shipped within the Continental USA and weighing less than 12 ounces will be shipped via USPS Priority Mail, Orders greater than 12 ounces, or being shipped outside of the Continental USA, will be shipped using whatever USPS service is offered based on the package size, weight and shipping destination. If multiple USPS services are available for a particular package / destination we choose a service at our discretion. We also accept Checks & Money Orders by Regular US Mail. To pay by Check or Money Order Just click on "print order to mail", under ways to order, on the shopping cart page, and mail the printed form with your payment. For quickest turn-around times, place your order online, with our Automated Online System With No service charge 24 hours a day, 7 days a week. As an independent online retailer, we maintain our own online shopping platform based solely in the state of Texas, so we are able to pass these savings onto our customers. No Sales Tax on orders shipped outside of the state of Texas! Most orders ship within 48 hours, All Orders ship within 14 days unless otherwise noted. We cannot be responsible for customer time restraints, late ordering or carrier delivery time. Tracking numbers will only be provided via e-mail. Address Corrections during package transit are not available, please enter the correct shipping address when placing your order. Package Tracking & claims of missing packages. 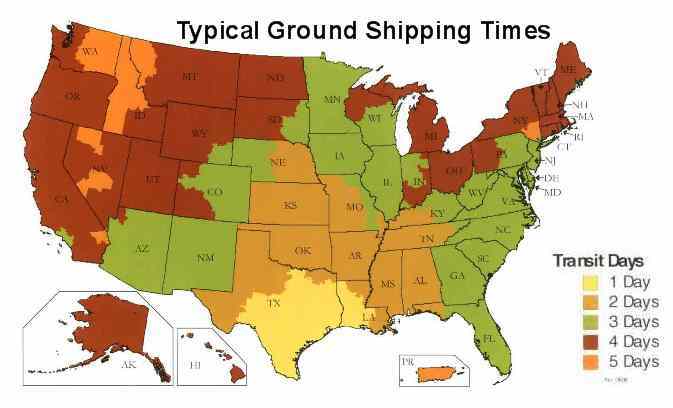 In most cases, using major shipping services and common carriers; tracking information for packages and freight shipments is not available past 90 days from date of shipping. Therefore we will not accept any claims of missing packages or shipments past 90 days from the date the order was placed with us. There are absolutely no returns on samples, swatch books, or catalogs! No package will be accepted without RGA approval number clearly printed on the outside of the package. When submitted, your request is sent to our returns department for approval. When approved, you will be sent an email with a return goods authorization number. If your return request is denied for any reason, you will be notified as to the reason and how to obtain further assistance. Please do not return merchandise without first obtaining a Return Goods Authorization Number. Please Note: Through our sample program we offer samples of all Fabric/Material & Webbing that we sell; therefore the customer is able to evaluate the suitability of these items for their particular needs prior to purchase. Accordingly, there is no refund or exchange for Fabric, Webbing or other items (except hardware) unless through OUR mistake, we sent you the wrong type, color, variety, etc. All unused, unaltered Hardware may be refunded or exchanged. Shipping charges are not refundable. Hardware and merchandise sent due to our mistake is refundable within 30 days of the order date. No refunds will be issued after the 31st day of order date. Restocking fees of up to 25% may apply on all returned merchandise, higher restocking fees may apply if the merchandise has been cut or modified in any way. Returned grommet kits larger than size 5, and bench mounted grommet setting presses and dies will be charged a $50 restocking fee which is the same as the rental fee charged on these items. Please allow up to 3 weeks to process a refund. Customer is responsible for return postage unless the refund or exchange is due to OUR mistake. Cancellation of unshipped orders may incur up to a 25% restocking fee, based on the total order amount. If the order has already been shipped see our refund & exchange policy. SAFETY NOTICE: Unless otherwise noted on the individual product description; AH&H brand Pre-made straps are Not intended for use in life safety devices or cargo restraints in a motor vehicle or aircraft. It is the responsibilty of the customer to determine the suitability of these products for use in their particular application. American Home and Habitat Inc. assumes no responsibilty or liability for damages arising from the customers improper use of these products, beyond replacement of product, should it prove to be defective. NO product listed for sale on this website is suitable for life safety devices, nor are these products capable of safely supporting human loads unless specifically noted in the individual product description. International customers are responsible for all customs taxes, duty fees and all applicable port charges. If shipping your order order incurs any expenses that you were not charged for at the time you placed your order, your credit card may be charged at a later date to cover those expenses. You will be provided proof of these expenses upon request. Most International Orders will be shipped using United States Postal Service. Various countries have limitations on the maximum dimensions and weights of packages delivered through their respective postal services and Commercial Carriers. Please note that we may fold material in half before rolling it and / or ship the material in separate boxes to reduce the weight of individual packages. We will make every attempt to minimize the number of folds, and minimize the number of separate packages when shipping material internationally. Please keep in mind that folding or splitting material into different packages may be the only practical way to ship your order. We will make every reasonable attempt to contact customers before shipping, if we are forced to fold material that would otherwise be rolled, or if we need to cut materials to place it in different packages to ensure that all packages meet the maximum weight requirements of your particular country and ours. Customers with projects that require Non Disclosure Agreements (NDA) or Special Work Contracts (SWC) must submit their NDA or SWC in writing (on paper) by regular postal mail accompanied by a check or money order in the amount of $500 (in U.S. dollars) payable to American Home & Habitat Inc. This $500 Document Review and Project Consulting (DR&PC) fee is payable by check or money order only; payment by credit card or debit card will NOT be accepted for payment of this fee. This $500 DR&PC fee is non refundable, but may be credited toward merchandise or manufactured products purchased from American Home & Habitat Inc. within 1 year of the date of payment of the fee. NDA's or other SWC's with customers will only be executed by AH&H and put into effect after receipt of this $500 DR&P fee in the manner described above. Engineering Services and Legal Advise - We do not provide either. We do not have a Patent Attorney nor a Licensed Engineer on our staff and AH&H employees can not provide legal advise, engineering services or design information for any product or project that contains designs for any life safety device or in any application that can result in harm to people or property in any event or usage of any type. If your project or proposed product has the potential to result in harm to people or property in any way shape or form, or you have an interest in obtaining patent protection for your "invention"; then your project or proposed product requires a Patent Attorney, Licensed Engineer and/or other professionals, and you are hereby advised to consult with the correct licensed and certified professionals in their respective areas of expertise. American Home & Habitat Inc., it's employees, stockholders and officers assume no liability for any damages or loss of any kind that might arise from the use of, misuse of products or any advise given to customers regarding or related to the use of any materials or products that we manufacture or sell. Detailed product specifications may not be available for all of our products. Additionally, product manufacturing specifications change from time to time. We can not provide detailed product specifications for specialized engineering and scientific applications. If you need detailed product specifications for engineering and scientific applications, we suggest that you purchase sample quantities of the product and conduct your own testing or contract with a private laboratory to conduct testing for you. All Materials, hardware, fabric, webbing, hook and loop, tools and accessories may vary in size, dimensions, color shade, or or other specifications, these variations are normal, unavoidable in nearly every industrial process, when materials are manufactured using new, different, or recalibrated machinery, and will vary from one batch or lot to another. If the variation is significant and notable and outside of normal parameters for the particular product, this information will be listed on the individual product's web page. We use industry standard SSL level 3, 256 bit encryption. When you enter your credit card number into the order form, it is transmitted across the Internet in an encrypted (scrambled) form, and then decoded when it gets our credit card processing service. After your credit card is processed and billed, American Home & Habitat only retains the last four digits of your card number for order tracking purposes. When you shop on our site, we collect personal information from you such as your name, e-mail address, billing address, shipping address, telephone number, product selections, credit card or other payment information. We may also collect the URL you came from, IP address, domain types (e.g. .com or .org, etc. ), your browser type, the pages of our site that were viewed during a visit. American Home & Habitat is committed to protecting your privacy. We do not sell, rent, lease, give, exchange, or share your personal information with anyone. We use customer information we collect only for the purposes of filling orders, contacting purchasers to inform them of their order status, enhancing the operation of our site, for statistical purposes and to administer our systems. Also, we may occasionally send you promotional information. If you do not want to receive email or mail from us in the future, please let us know by sending us a message via email or postal mail or by calling us. Our computer system protects personal information with advanced firewall technology. 1. Use our online shopping cart, in step 3 - Payment Method, select "Pay by Mail" this will generate a PDF order form which you can mail back to us with a Check or Money Order. 2. You can order on-line without sending your credit card number over the Internet. Just complete our on-line order form, in step 3 - Payment Method, select "Pay by Mail" this will generate a PDF order form. Call us by phone with your credit card information. 3. If you prefer, you can call during our business hours, and place your order by telephone. Disclaimer and Legal information regarding Facebook use and our participation in social networking services &amp; media Sharing services. About Our products and efforts to help the Global Environment. We at American Home & Habitat Inc. Specialized Textile Outfitters applaud and support efforts to help improve the global environment and to promote environmental sustainability and recycling programs. We promote and carry a complete line of All Natural Cotton Canvas which is undyed, unbleached and untreated with chemical additives. All synthetic Materials listed for sale on our website that are C2C certified will be duly noted on the individual product's web page. Most of our Vinyl Composites and Rubberized materials and some other products that we carry contain Chlorinated Polymers and or Halogenated Hydrocarbons. These substances prevent materials that contain them from degrading and chemically breaking down when exposed to the elements such as UV (sunshine), microbes & bacteria, direct ground contact, water, mildew, oxidation etc. These substances have been proven to prevent materials from decomposing when exposed to the elements in nature; sometimes for decades or longer. Not all of our products are for every application.... If your environmental consciousness calls for a material that is environmentally sustainable (i.e. has short life cycle) allowing it to be quickly recycled back into nature, we carry a complete line of 100% cotton canvas, both 100% unbleached and undyed that will surely not offend mother earth, peacefully returning to nature when no longer needed. However, If your mission requirements demand a product that will last as long as possible, when exposed to harsh conditions, in situations where equipment failure can mean the difference between life and death; we carry a complete line of Specialized Materials, Vinyl Composites and Rubberized Materials designed to last as long as possible when exposed to the elements.